Packing light is always the best option but it is hard to limit items even if I am away for a few days. Everything is essential right? As I am only taking cabin luggage with me, it is even more difficult to compress everything especially with the liquid and aerosol rules. Liquids needs to be placed in a clear bag no bigger than 20 x 20cm, each item must be in a 100ml or less container, no more than a litre of liquids in the bag and one bag per person. Too many rules to take into consideration. Shampoo, Bioderma Sensibio H2O Micelle Solution , Revlon Colourstay Liquid Foundation, La Posay Roche Effaclar Duo+, MAC Prolongwear Concealer, Origins Spot Remover Anti-Blemish Treatment Gel, Toothpaste, Eyecharm Falsh Eyelash Glue, MAC Liquidlast. MUA Pro Heaven and Earth Eyeshadow Palette, MAC Prep + Prime Transparent Finishing Powder, Sleek Face Form, EOS Lip Balm, Bourjois Cream Blush, Clean & Clear Oil Film, Bobbi Brown Eyeline Brush, Real Techniques Kabuki Brush, Rimmel Eyebrow Pencil, Superdrug Eyelash Curler, Sigma Buffer Brush F45, Real Techniques Expert Face brush. Maybe this isn’t just makeup actually. I this a lot of products? I’m missing a few bits and bobs like face wash and mouthwash but as you can see I have no room left. Looks like I’ll need to get the travel sized products at the airport. I need to get back to packing. 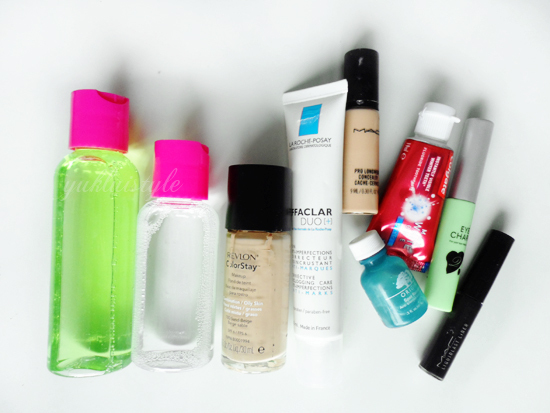 Do you pack lightly for your travels when it comes to skin care and makeup? Omg I never pack light and my clear plastic bag can barely close because I insist on taking so much makep in my carry on bag D: Will probably take a leaf out of your book and actually pack some skincare this year for the long flight, instead of just a pack of wet wipes. Have a good time in Valencia! Nice selection of products 🙂 I try to travel as light as possible! I hate travel packing all my liquids, it's the worst chore ever haha. 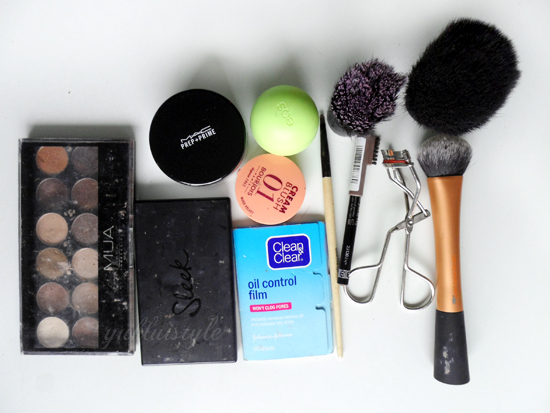 This post is useful in helping tackle the packing though! Love posts like this! I like to get miniature travel sizes when I can. This is a great post! I can't live without those oil sheets.